A Perfect Storm? Um... Pass. My little part of the world has seen two cyclones cross the Queensland coast in the past week. 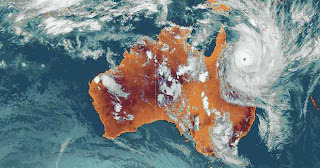 The first was a category two, and a baby compared to category five, Cyclone Yasi. Category five is as big as you get but Yasi set new records for our country. As you can see from the image, not only was it a strong system but it was an unfathomable size as well, swallowing a huge chunk of Australia. We were lucky. My little town didn’t suffer any major damage to infrastructure, but for other parts of country that luck ran out. Category fives can level houses, tear roofs apart and take lives. No lives were lost this time, but please spare a thought for those who no longer have a place to call home. The extent of the damage is so wide spread that it will take weeks to cover those houses that have had their roofs torn off and in the meantime the rain pours down on what is left. This is even more heartbreaking in the wake of the Queensland floods. The cyclone season doesn’t end until April but hopefully Mother Nature is planning to holiday in Tahiti for the next few months. Otherwise, I think we really need to start delegating our natural disasters. Who’s up for a cyclone experience? Anyone? What’s really inspiring about this time in our lives is that people are pulling together and helping one another. Australians have travelled from all across the country to donate their time and expertise to rebuilding after the Queensland floods and I know the victims of Yasi won’t be forgotten. Argh, Lacey, I didn't know you were in the Yasi area!! How are you coping? I saw how big it was on the news and was freaking out for everyone. You Aussies don't do things by halves do you? :-) Big hugs to you! I also live in a tropical country and our cyclone seasons are same, November to April. So I do know what all's happening to your country and I sympathise with all people affected by the earlier floods and then hit again by the cyclone. I pray that we all can escape Mother natures wrath any further. I've lived in Florida long enough to be very grateful you didn't have any serious damage from the storms. It's odd how some years the storms come one after the other and other years are so quiet. I hope the rest of your season is nice and calm!!! It gave me shivers reading your post, Lacey, Queensland really has had an awfully scary time. So glad you and yours are ok and I totally agree, no more horrible disasters on Australia now! Nas - I know it's not my favorite times of the year :-). I think they predicted five or six for the country this year and we've had four. Do you find the frequency is increasing where you are? Julia - It seems hurricanes and cyclones are the price you pay to live in paradise :-) This year is definitely one of the ones where the storms are coming one after the other and we seem to get more of them than we used to too. Joanne - From your lips to God's ears :-) Fingers crossed for a lot of sun. I did see a rainbow the other day. It seems Katy Perry got it right "...after a hurricane comes a rainbow..." lol!